Jamil Scalese: Yeah, they seem to be using the wrong Artemis. Zack: Unfortunately, in Season One Volume Two the show takes a downturn. I don’t know how old the writers are, but they can’t seem to see teenagers as anything other than petulant brats. For all the mentoring they have received at the hands of older, wiser heroes, the Young Justice group causes more problems than they solve just by their constant whining and temper tantrums. Jamil: Well as much as do tire of the amount of teen angst that radiates from the show, we do have realize that this is basically a high school setting with a cast in their early teens. It is a bit annoying that we have to watch these characters grow as people before heroes, but again, they were sidekicks for a reason. Zack: Kid Flash in particular is poorly handled. Not only can do the writers not seem to understand his powers—he can run really fast but he can’t dodge a punch? Since when can a Flash not dodge a punch? —but he is continually stuck in immature, girl-chaser mode. The Kon-El/Superman dynamic is a little more interesting, as Superman doesn’t want to take responsibility for this illegal clone struck from his DNA. The two female characters, Miss Martian and Artemis, get to be the least of the “petulant brat syndrome,” but they seem to really only be concerned about which boy on the team they are going to hook up with. I thought they were doing something interesting with the last DVD by taking Robin out of the leadership role, but I see know they were just taking turns. Jamil: Well, I’ll take my Wally West any way I can get them these days! However, I agree on the amount of flirtation in this series. On one level it’s redundant and off base, but on another I do like the authenticity of putting teenagers on an island and being real about their reactions to each other. In this second block of episodes we really start to see the characters start to overcome the initial reluctances and build relationships with each other. As gratuitous as it is, it’s necessary to have the kids fell each other out. Zack: The writers seriously need to change the way they are handling these characters. The rest of the series is so cool. Dr Fate’s Tower! Klarion the Witch Boy! Bruce Wayne and Clark Kent going out to a cheap diner for pie! 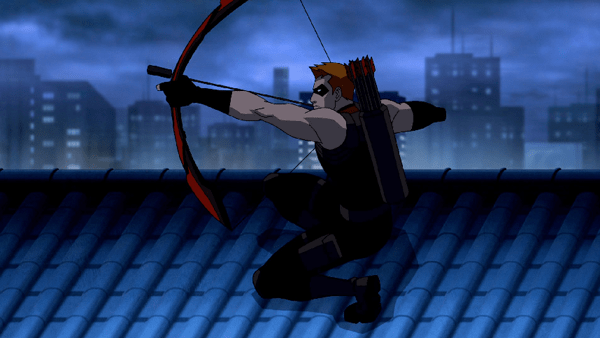 The Red Arrow/Artemis/Green Arrow dynamic! Everything about this series is a lot of fun except for the main characters, and even then only when they are in the spotlight. Jamil: One can’t deny that the focus has been shifted away from the individual characters in the series up to this point. The last two episodes on this disc were the first to truly focus on an individual, with the previous shows approaching it from the “team” angle. Still, that has allowed for all the little quirks of the show to shine. 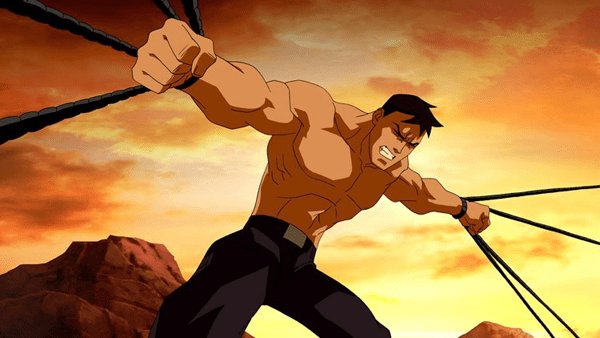 From Black Canary led training lessons, to appearances from Amazo and Clayface, Young Justice has been brilliant in their cast choices and featuring both the good and bad guys in great character moments. Zack: Superboy is a big baby. First he refuses Black Canary’s training because someone as powerful as he is doesn’t need to know how to fight. Then he takes off by himself to battle the escaped Amazo android, putting his friends in jeopardy and generally being a jerk. He learns an important lesson about limits and teamwork. Jamil: Superboy is a good character, but the slow climb out of that emo pit he’s dug for himself is going to be tough to watch. The mini-Hulk act is already wearing itself thin, and in the same way you complained about Wally, his power levels seems to fluctuate greatly. As cool as the Black Canary scene was, I have a hard time she’d be able to counter Superboy across the room like she did. I liked this episode though, because I’m a big Amazo fan, and loved the action scenes of the android beating down the entire team. Zack: Artemis and Red Arrow are big babies. Green Arrow introduces Artemis as his new protégé. Red Arrow tries to fight off an evil cloud by himself. Artemis tries to take on the assassin Cheshire by herself. Red Arrow and Artemis learn and important lesson about working together, and the dangers of rivalry. Jamil: The inclusion of Artemis was a big head scratcher to me at first, especially since I thought Speedy would play a bigger part. That said, I love how they’re approaching his relationship with the team and the female archer’s role in the series. The whole Cheshire/Artemis subplot is intriguing, but therein lies a danger of using such second tier antagonists, I have no idea who she is or her place in DC lore. Zack: Kid Flash is a big baby. 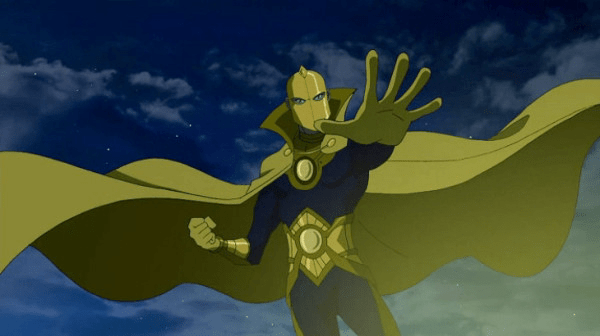 There is a break in at Dr. Fate’s tower, but Kid Flash doesn’t believe in magic. He pretends to believe in magic because Miss Martian does, but that causes all sorts of trouble. Kid Flash leans an important lesson about the power of believing. Jamil: The episode has some flaws, but this is one of my favorites of the young series. Two reasons: Wally West, and the whole, well-executed magic vs. science theme. The choice of villains for the episode, Abra Kadabra and Klarion, meshed well with the science-based Kid Flash. I loved how Wally kept coming up with practical, but extremely involved explanations for the sorcery around him. Zack: Aqualad is a big baby. Even though he is hand-picked to be Aquaman’s protégé, he would rather stay behind in Atlantis and moon over Tula. Tula (as anyone who reads comics knows) loves Garth. Aqualad fights some fish monsters, and learns an important lesson about letting go and being happy for your friends instead of being selfish. Jamil: I think Black Manta would be insulted to be called some fish monster, Zack! (Hell, one of the characters should call him dad…whoops spoiler.) Actually, watching this episode for a second time it has a lot of small moments that actually made the ubiquitously boring underwater episode quite watchable…however most of those moments happened on the surface world. I particularly liked Miss Martian and Superboy having an awkward staring moment and the scene at the Allen/West household with the three holders of the Flash mantle enjoying a family dinner. 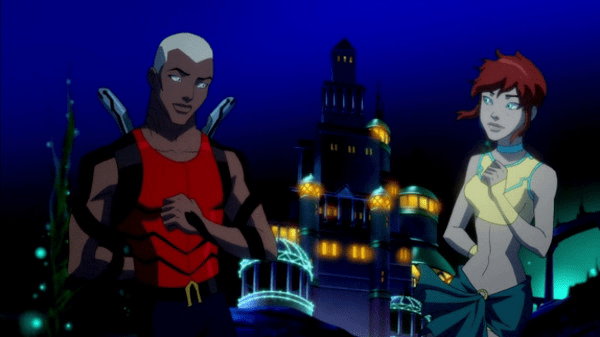 This episode focused on the entirely new Aqualad, and I’m surprised at how quickly I’ve grown to like Kaldur. It was a smart move by the writers to make the brand new creation levelheaded and even keeled rather than someone like Kid Flash or Robin. Speaking of the Boy Wonder, this episode brought up a question that won’t leave my head: Can Batman dunk? Zack: Again, four freaking episodes. No bonus features. Total runtime – 90 minutes. Also, there are twenty six episodes in the series and they have released eight so far on two DVDs. That is a lot of DVDs to buy to get the first season. This is a terrible, terrible DVD that you should never buy, and you should refuse to support these kinds of cheap business practices from the WB. Vote with your dollar. Wait for the eventual Season One collection. Jamil: Sometimes the commercialization and immediacy of things these days don’t make sense. With nearly another twenty episodes left in this season (a huge of chunk of which have still yet to air) why release two discs with four episodes a piece? Young Justice is one of the best comic cartoons on the air, especially for those looking for a fix in since Justice League, but it’s not “crack good” where you need to run out and grab the episodes as they release. If there’s one we totally agree on it’s this: wait for the completed season one disc. Zack Davisson is a freelance writer and life-long comics fan. He owned a comic shop in Seattle during the ’90s, during which time he had the glorious (and unpaid) gig as pop-culture expert for NPR. He has lived in three countries, has degrees in Fine Art and Japanese Studies, and has been a contributing writer to magazines like Japanzine and Kansai Time-Out. He currently lives in Seattle, WA with his wife Miyuki. You can catch more of Zack’s reviews on his blog Japan Reviewed or read his translations of Japanese ghost stories on Hyakumonogatari Kaidankai.